It is the time of the year where dandelions are popping up everywhere. 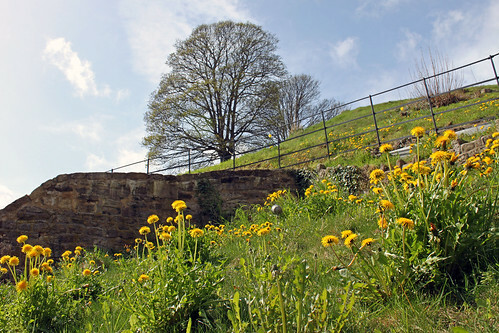 This shot of Dandelion flowers is quite attractive (taken by Oxford Castle Mound). But, in the border and lawn dandelion is classed as a weed. 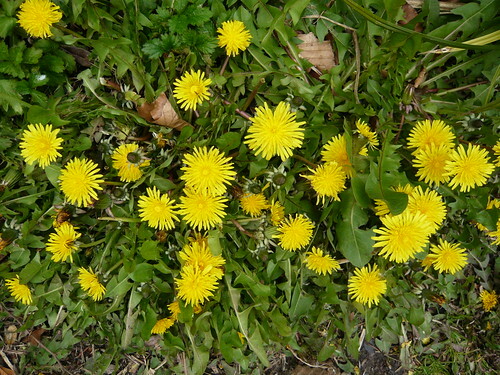 In particular dandelion leaves will smoother the grass and make it weaker in the long term. It is a tough weed, but definitely beatable. For a small number of dandelions, I do recommend digging out the tap root with a trowel or custom weed trowel. The secret is to try and get as much of the root as possible. In practise, it is hard to get everything. But, it means that when it regenerates from a small bit of root, it will much easier to finish off with weed killer. It is best to dig dandelions when the soil is dry as this makes it easier to shake off the soil surrounding the dandelion root. If you don’t have time or energy to dig up dandelions, you can resort to a weedkiller which is designed for broad leaf weeds. You can either spray or paint it directly on to the leaves. It may need 2 to 3 treatments to finally kill them off. Now is a good time to act, as if you let them go to seed, it will be just storing up more work for the future. Dandelions aren’t the end of the world. This makes quite an attractive picture. Another option is just enjoy the flowers and pick the leaves and flowers for salads. If you are really keen, you could roast the dandelion root to make a healthy organic dandelion coffee. Roundup Weedkiller concentrate. Good for large areas which need treating at Amazon. Unfortunately, my lawn has a lot of moss (if you look closely) this is because I’ve gone for the ‘wildlife effect’ i.e. too lazy to mow the lawn. Moss is a signal of a lawn with problems. To control the moss, it is important to tackle the underlying causes of moss. Dry sandy soils which are infertile. Too Much Shade. Moss is almost inevitable in heavily shaded areas. You could cut back the trees, but, it can be a shame to remove a shady spot on the lawn. Don’t forget moss is not the end of the world. Basically, moss thrives where grass struggles to grow. The best way to prevent excess moss growth is to provide conditions for strong grass growth. This involves. Regular grass feed and use of weedkiller. 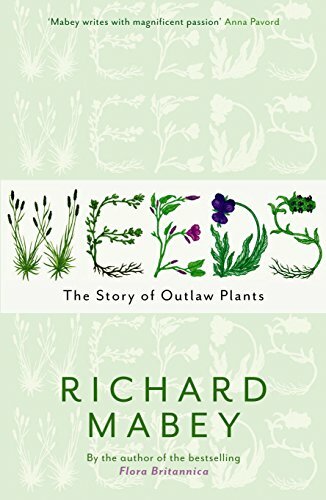 One weed that some gardeners wish they were able to grow – well then can but not always legally. A form of grass that if you water it with neat whiskey it comes up half cut! Cannabis the easier name to spell than Marijuana is typically considered to be one of two species Cannabis indica and Cannabis sativa. Skunk and not Skunk cabbage but with an aroma to be sniffed at. 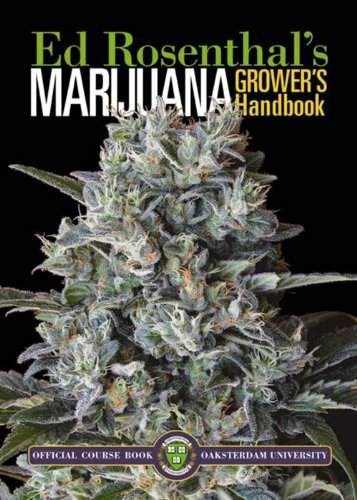 Humidity, temperature and ventilation are all vital to getting your grow right. Hash is concentrated resin produced from the flowers of the female cannabis plant or hash is the mess I make of sowing very small seeds. Get a Joint to easy your joints or call it a spliff, bone, nail or, when smoked down to the end, a roach. 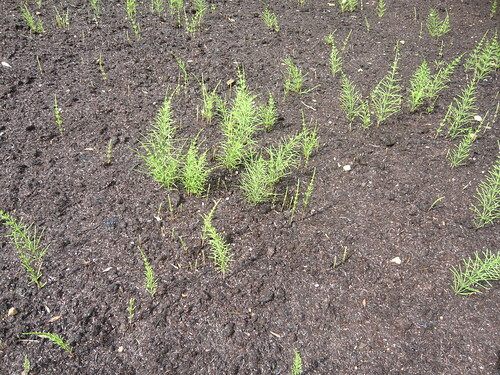 Mare’stail or Horsetail is a common garden weed that flourishes on damp soil. Even the RHS is prone to Horsetail as the picture taken at Harlow Carr Gardens demonstrates. I look forward to seeing how they cope! The plant reproduces by spores that are readily wind dispersed but most problems come from the rhizomes. Rhizomes are extensive both horizontally and vertically and may reach over 5 feet deep depending on substrate. Rhizomes break into small parts and reproduce quickly. Tubers are then produced at the nodes of the rhizomes. You can’t dig it out, although you may weaken the plants if you remove as much root as you can then hoe when you get above 1″ shoots. 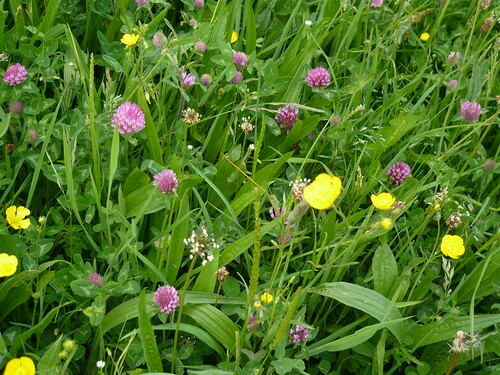 The wet weather in May and June has brought out a good crop of clover and meadow flowers for our local farmers. Praise be the hay making will produce some juicy animal feed and the fields have looked particularly good. 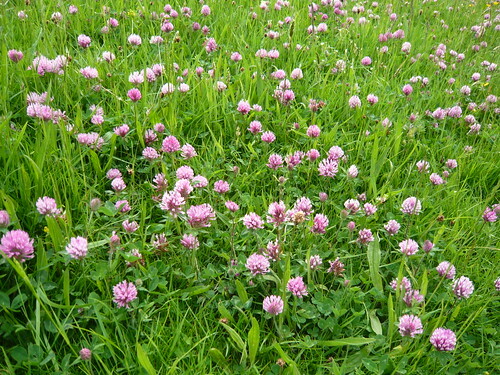 Clover can be used as a green manure if you have a large patch in your garden. Grow it then dig it or rotovate it back into your soil. Green manure acts as a good soil conditioner increasing the humus content. Clover adds or fixes nitrogen into the soil via its roots. Clover is a beneficial weed because it attracts good insects particularly species of wasp, which do not sting but do eat aphids. Bumble bees will also be attracted in to your garden. Red or white clover can create a green, low-maintenance lawn or groundcover as it did before herbicides were used in great quantities to manicure lawns. There are circa 250 species in the genus Trifolium or Clover aka Trefoil of which Trifolium repens is the common white variety. 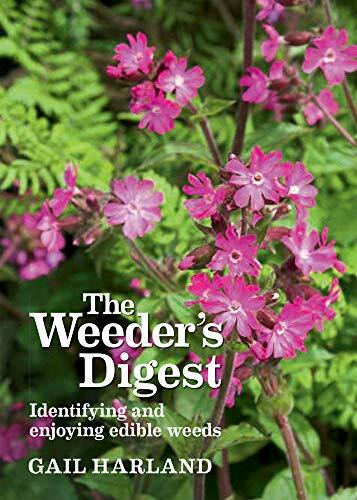 Continuing on our theme of garden weeds – these are some of the most common garden weed types, which you will invariably have faced at some time. 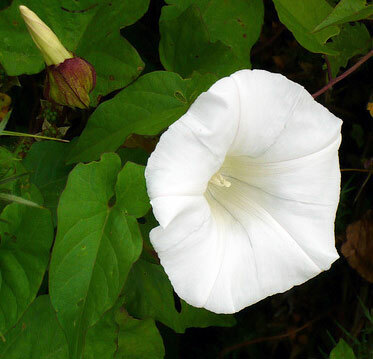 A very common weed which spreads through a system of fine underground stems. On a dry day try digging with a fork and on regrowth try spraying with Glyphosate. Covering with a mulch or solid layer is a good way of weakening or killing the plant. See Dealing with horsetail. Has been around for 60 million years, if you have some in your garden you will see why. One of the most difficult weeds to eradicate. Quite easy to deal with. 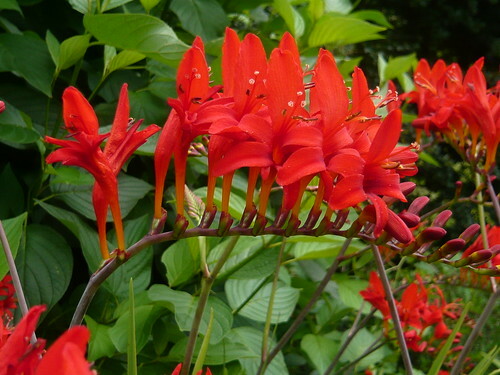 If you are not in a rush, make repeated cuts at the base of the plant and put stems on compost. Nettles make excellent compost and are an excellent mix of stems and leaves. Young leaves can even be eaten and are quite nutritious. Nettles are also good for wildlife. To kill off the plant use fork or spade to lift up the clumb of yellowish roots. These are not too deep. Also responds well to weedkiller. In spring these will suddenly grow very vigorously. Before you know it they will have set seed and will be a problem for years to come. Therefore, the best time to act is before they set seed in late April. They have a simple long tap root. It is hard to lift up the whole tap root without breaking off the lower part which will send up new shoots. However, it can be satisfying to try and dig up the long single tap root. Will respond to repeated weed killer sprays. As the saying goes where there are nettles, there will also be docks. Similar to dandelions. long tap root and can easily regrow from the smallest part. Grows through deep connection of underground white roots. Also flowers (actually very attractive) and sets seed. The roots can be a pain to dig up. But, for deep infestations, it is best to try and dig up most of the roots. – Another tough nut you don’t want to see in your garden. Can spread rapidly if left unchecked. Requires hard work to get rid of it. Broad Leaved Willowherb. Can set thousands of seeds. Not too difficult to deal with in small quantities. Budleia – In one sense makes an attractive plant – loved by butterflies, but, has immense powers of reproduction, growing in most unlikely of situations. Thistle. A good hoeing should be enough. Cleavers. – Stick to your clothing. hoeing should be fine to get ride off. Broad Leaved Plaintain. – Not too bad. Creeping Buttercup – a vigorous spreader. Can grow in middle of crass and through the border. Needs its roots tackling. White clover – a common grass weed. Roundup Weedkiller concentrate. Good for large areas which need treating. 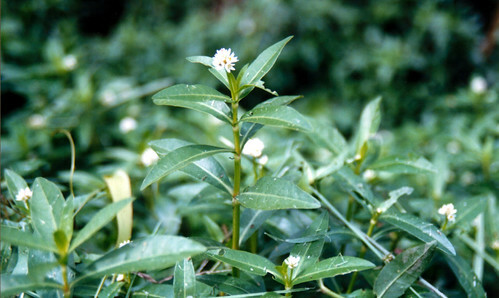 Alligator weed by Brisbane City Council CC BY 2.0 a snap of a weed I have never come across and have no wish so to do! Knotweed problems have not gone away but panic isn’t the solution. 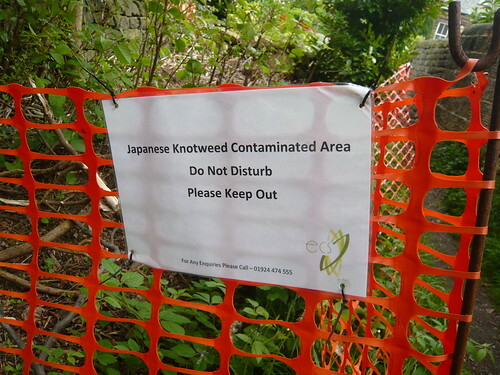 It is an offence to plant or otherwise cause the Japanese Knotweed to grow in the wild. Japanese Knotweed is classed as ‘controlled waste’ and as such must be disposed of safely at a licensed landfill site and buried to a depth of at least 5 m.
This law also applies to the surrounding soil. 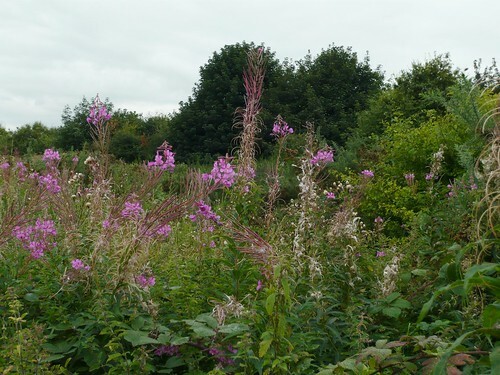 Infringement can result in an unlimited fine and you can also be held liable for costs incurred from the spread of Knotweed into adjacent properties. ‘A weed is any plant growing in the wrong place’ – but some weeds are more wrong than others. Unfortunately weeds are not weedy but more thuggee. 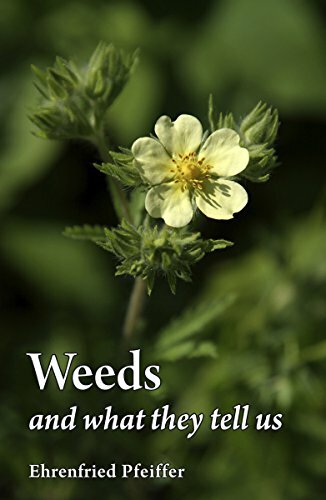 At their worst weeds can take over and suppress all other growth. 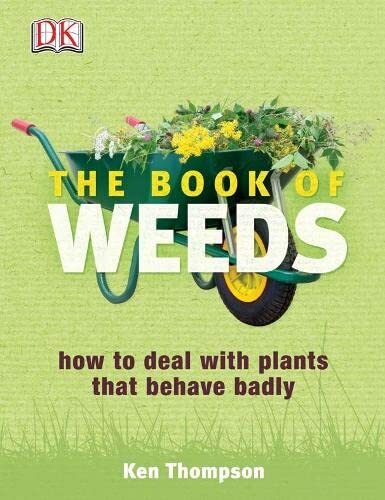 Weeds take water and nutrition from the soil and rob your plants. Other cultivated plants can’t fight weeds and give of their best at the same time. Weeds can throttle and kill weaker species and cast a shadow over others. Before we get onto chemical warfare you can fight weeds at there own game. Cover the weeds with a membrane to exclude light. Cardboard or layered newspaper may work and you can plant through this covering. Add at least 2″ of mulch and soil on top. Hand weeding is the Rolls Royce method. You have to keep up to this job on a regular basis. When digging over a patch take care to remove all perennial weeds and bits of their roots. (Don’t compost the roots). Annual weeds can be hoed so the roots can’t access water and thus die. Weed killers are available from most garden centres. Glyphosphate is a systemic chemical that enters through leaves to kill roots. It is ineffective and dissipated as soon as it hits the soil. 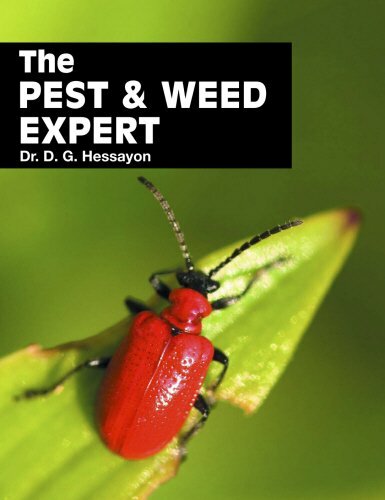 Spray in autumn and spring on growing weeds but avoid your cultivated plants. Selective chemicals are available for lawns. Do not let weeds seed. Cut off weed flowers even if you can’t remove them. Do not compost seeding weeds as they may not be killed by the heat of the compost. Kill weeds when they are young. Grass is designed to be green but gardeners being what they are they often want to get Black Grass. Ophiopogon planiscapus Nigresens is often called Black Mondo. It is a rhizomus grass with delicate flowers. The snowdrop sets off the grass which is easy to grow but occasionally slow to spread. It makes a gothic garden feature or fits in well with a ‘black foliage and flower garden’. The straplike, shiny black foliage grows in little tufts and combines well with many other plants. Ophiopogon planiscapus Nigresens is not to be confused with Black-grass Alopecurus myosuroides or Black twitch. This is an annual weed native throughout the UK. Plants and framed photographs are available from Amazon. 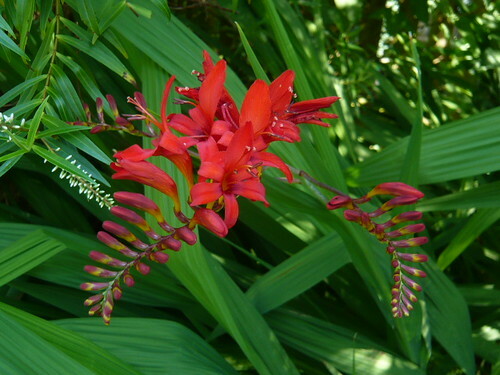 For a strong red Crocosmia the variety ‘Lucifer’ is as red as hell! The corms like lots of water but stop short of water logging the soil. Stems and sword shaped leaves will grow and stand upright but if they are in the shade they will lean towards the light. 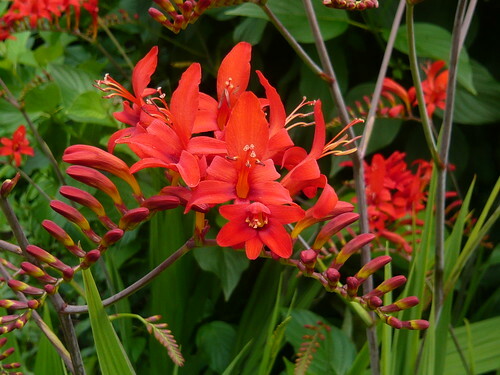 Get new plants by dividing the clumps of corms in Autumn. 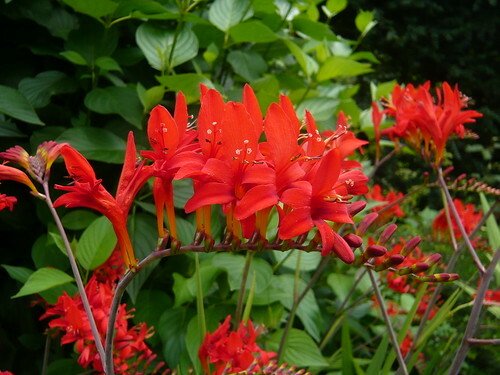 The strong red shows upwell against the green of the leaves and other green backgrounds in your garden. 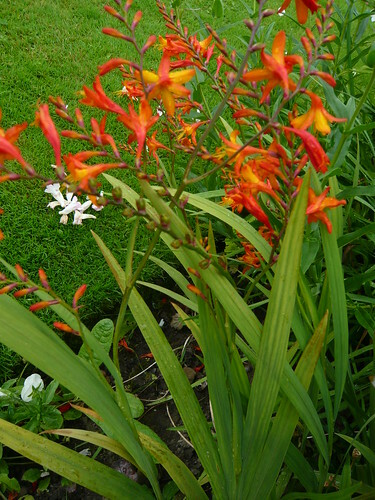 The book ‘Crocosmia and Chasmanthe (Royal Horticultural Society Plant Collector Guide)’ by Peter Goldblatt, John Manning and Gary Dunlop plus a range of Crocosmia products are available from Amazon.